Demand has been so high that we’re usually back-ordered on all sizes. Our normal retail price will be $299.99, but for now we’re offering a discount! What’s included: The Cold Shoulder vest, sealed ice packs, full instructions for use, and our New You letter with diet tips. The Cold Shoulder is a fine tailored garment, and requires precise measurement for correct fit. For both men and women, you want to measure your chest around the widest. 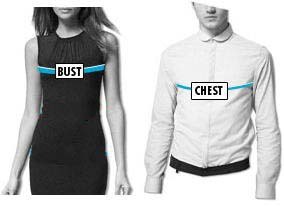 In the following diagram, women should measure the “bust” size, and men should measure their “chest” size.